The Best eBook reader Android Apps to read ePub and PDF books with great reading experience. Printed books are losing popularity as electronics readers gaining popularity. People now love to read on their smartphones and Tablet as they can take their favorite books with them on the go. Specially tablet devices offer a great experience for reading books as they are light-weight, very compact and capable of storing thousands of books. Turn your phone or tablet into a great mobile library with the following ebook reader apps. It is a big help in our studies with numerous reader app. You just have to download a copy of the books you need and read it at your convenient time. No more carrying of back-aching bags full of bulky books. All you have to do is to collect the PDF and eBook version. Put them on an android device with a great reading app and you are good to go. Our goal is to find Some of the best reading apps to read eBooks, ePub books and PDFs which you can be downloaded for free. Let’s have a look at the list of Best free book apps for android. By the way, many of us love to Download Ebooks, ePub books and PDF books over the internet. Some of these apps allows to simply transfer them to your device and read books anywhere. 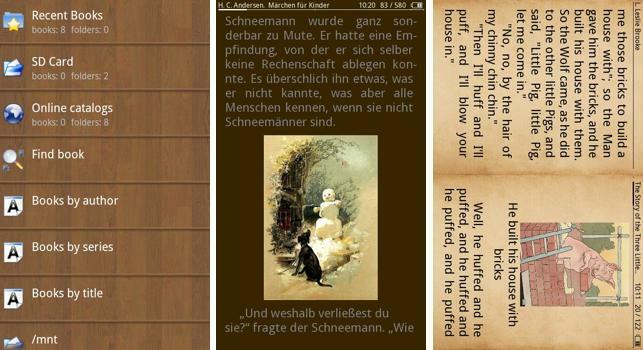 Let’s focus on some of the best android Reader Apps to read the eBook, PDFs and ePub books. Google’s Play Books app is the fanciest and best Ebook app. As you can guess from the title, google has to offer a broad range of books from its play store where you can download free ebooks for android and purchase the premium books. Millions of ePub books available on google’s library for you to browse and download. On the feature side, the app comes with all the functions you would expect from a good reader app. Another great thing is that its sync across all your devices means you can start reading books on your tablets then resume reading where you left on your phone or the computer. It supports the most popular e-book formats. Use the widget below to download Google Play Books App. One of the greatest product Amazon has ever made is the reading tablet Kindle. The Kindle app could be considered the best eBook reader ever. With the Kindle app, you get the same great reading experience on tablets. Also, the book collection is so enriched that people like to go there than moving between different sites. Most of us know how popular Amazon Kindle Fire tablet among the readers for its content and great reading experience. Well, you can get the same experience on your phone or tablet with their Kindle app. Similar to play books, users can download and Read Free Books—Choose from thousands of free ebooks and Easily shop for eBooks, including new releases and New York Times Best Sellers. Consider Kindle app as the one of the best ebook app for android. Not enough time for reading on eBook reader? Nook is the app which contains a vast collection of books. Like Amazon, you can buy or download your books from Nook’s store. The company also adds new features regularly. The app offers vast possible options to customize your reading experience. Following Amazon’s move on google playstore, Barnes and Noble also brings their NOOK app. The company is already famous for its Nook Tablet and a full range content on their online store allowing users to get access of million of books and magazine. The app allows you to subscribe an excellent list of publication such as US Weekly, National Geographic, and The Oprah Magazine — starting with free for a 14-day trial period. Now check out a few more apps which allows to import pdf books easily and has good reading features. This app is highly recommended as it supports most of the eBook format. The reader app supports EPUB, PDF formats, and Adobe DRM encrypted books. A great alternative ebook reader and one of the best Pdf reader. The app lets you buy eBooks at the lowest price. EPUB or Adobe PDF books can be easily imported from your SD card, and you can even also download directly ebook of your choice on a device without using a computer to transfer files. Yet another great app for reading books. Thousand of ebooks are free to download through online libraries. Comes with a lovely day & night reading option for great reading experience without hurting your eyes. Real page turning effect seems very cool. The app also got gesture-based controls to do many things such as zooming, lock the page, adjust brightness level and many more. Download an ebook or pdf book on your device and instantly find it in Moon Reader library. The name describes the app- Cool Reader got an attractive UI that also offer a feature called “aged paper” with cool page animations. The comprehensive e-reader has some text options and some limitations. You may find it hard on first use but soon it will turn out to be a pleasure. Similar to play books, kindle nd nook, Kobo is a digital bookstore with over 5 million titles. Kobo offers an extensive catalogue of world’s best books along with a great selection of free eBooks. The app itself is a very basic reading app that does not allow to import files. But its a great app within its ow ecosystem for finding interesting titles. New user will get $5 credit to buy some to books to getr started. Recently released on google play store Mantano is a great choice. Read, annotate to any EPUB or PDF ebook with the most powerful ebook reader compatible with the Adobe DRM. With its advanced UI, the app lets you organized books in your collection. Allows to create annotations, highlights and bookmarks and Quickly access them. The integrated file explorer allows browsing through SD card and import books manually. This app might not look very appealling but it has a board range of features that benifit the readers. In additin to read ebooks, view PDF and DjVu files, read comics, users could also listen to audio books listening and document handling. The app also allows to send documents for printing directly. FReader alos promised to support all formats. You can chose form 4 themes, 12 fonts, 5 language (Russian, Ukrainian, English, French, German) support with built in translator, search for particular texts in a book and many more. FReader is a free app suported by ads. If you are looking for a full-featured reader app then EBookDroid worth its price. The app is capable of displaying any book format you throw at it (DjVU, PDF, XPS (OpenXPS), FictionBook (fb2 and fb2.zip), Comics Book formats (cbr and cbz), plus – starting with version 2 – EPUB, RTF, MOBI and AWZ3). EBookDroid is a fantastic comic reader too! Another interesting feature is flexible font mapping for PDF files. The premium version of the app available for $2.99 will unlock all the mortars and shells. The app supports many book formats including OPDS and LitRes. Cool Reader has to offers great reading time and its a free download. For most people on the go, carrying a copy of the latest paperback and magazines could be too heavy, or they just don’t fit in your bag. So why not make the most out of your device?Your Android device is a package of all kinds of entertainments and unlimited advantages, in particular with the right software. Check out these best reader apps on your device and decide yourself which one provides all the options you need. Found another useful reading app not in the list above? We would like to hear the name in the comments.